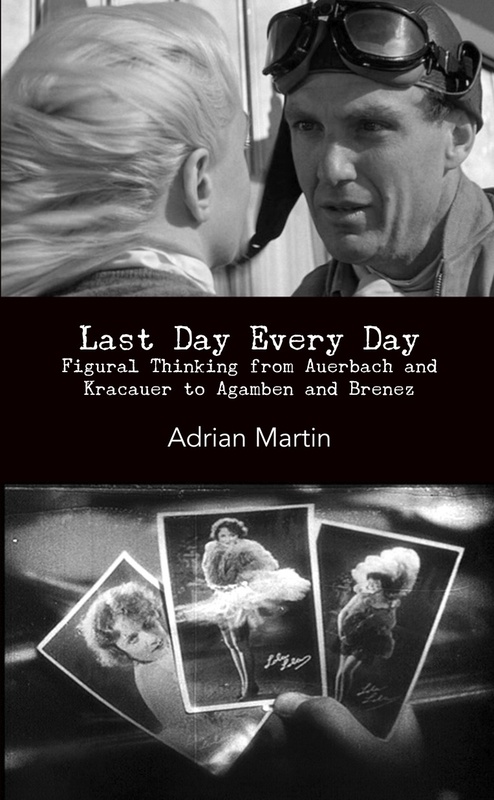 On first reading, one could deduce that Last Day Every Day is essentially (and as its subtitle seems to indicate) a tour through figural thinking, taking in a succession of its key thinkers. And indeed, the book does trace a path that can be regarded as an attempt at historicisation – but a history that does not pretend to be exhaustive, closed or chronological. The history that Last Day Every Day sketches is only one of many possible histories. A very personal and, in a certain sense, unique history. A history that takes as its basis a series of text-fragments arranged, as Martin avows, “more or less in the same order that these texts came to me, the order in which they found me” (1-2). The book explores these texts, revealing the felicitous relations between them, drawing a map of interconnections (some evident, others more intricate, but all imaginative and astute). At times, it lets itself be carried away on poetic digressions (such as the reflection of the act of name-giving); these fit surprisingly well with the central body of the work, and lever open the particular sensibility of its author. Last Day Every Day can serve as a fine introduction to figural thinking for those unfamiliar with the terrain. But while Martin dwells on a series of key concepts and notions, he never seeks to define his object in a flat, systematic way, nor tries to dissect it on the basis of a system of basic principles. This might be disconcerting to those readers (myself included) who come to this book without any previous contact with figural theory. But when we manage to go beyond the surface and ‘get jiggy’ with the game proposed by the author – which is nothing other than grasping the figural on the basis of putting it into practice, i.e., actually creating a figure – then the book shows itself to be a truly exciting and illuminating approximation: completely coherent with its object, and in perfect fusion with it. Also, in reading Last Day Every Day, we can immediately grasp that many of the paths and preoccupations of figural thinking are developed not in the realm of theory pure et dure but, rather, in its contact with artistic practice, with criticism and analysis. For example, a brilliant (but also short and concise) text such as Nicole Brenez’s ‘To Nuance Renoir’ – devoted to a concrete analysis of the figural relations between Partie de campagne (Jean Renoir, 1936) and Sombre (Philippe Grandrieux, 1998) – can tell us much, if not more, about figural thinking than some purely theoretical text, doubtless illuminating the ideas in a clearer and more direct fashion. Moreover, these days it is not uncommon to find writings on one or several films that, without displaying any sign of a theoretical preoccupation, raise – consciously or otherwise – ideas, intuitions or axes of investigation that are hardly alien to the figural. This is a happy, liberating confirmation (certainly liberating for me, but also, I believe, for those in the midst of the field, as these explosions coming from beyond theory are the best measure of its necessity, and evidence that it has come into being in response to an actual impulse). Something of all this is implicit in the very itinerary proposed by Last Day Every Day. Among the names that figure in the book’s subtitle, two of them – Brenez and Erich Auerbach – are incontrovertibly connected to figural thought. The former – because of his book Mimesis and, above all, his essay ‘Figura’ – opens a breach via a series of ideas or images (Judgement Day, the Hereafter, fulfilment, redemption …) that, in Martin’s exposition, are converted into figures; figures continually revisited, reworked and rethought within the book. For her part, Brenez provides the author with a more solid, theoretical basis – allowing him to outline the various approaches to the idea of figure and figuration, or offering an exquisitely poetic passage on the distinct types of shadow – since, as he suggests, it is she who “forged the word figure (and all its derivations: figurative, figurable, etc) for contemporary European film studies” (6). In Last Day Every Day, Martin lists three ways of situating the figural: “as something that flowered and died within a specific historical time and place”; as something that persists, “always latent, possible, virtual”; and, after Bill Routt, as something “absolutely fundamental, integral, inherent to the very act of criticism” (26-27). His book is born from the interaction between these latter two possibilities, and from his (very Auerbachian) conviction that we need both. Martin believes in this regeneration of the figural, which surges in different places and times, adopting various forms – but if there is something that Last Day Every Day confirms, in every way it can, it is that the figural trajectory can only be completed when its forms are submitted to interpretation, when they at last encounter their “recipient” (30). For Martin, as for Routt, “criticism is what fulfils the work of art, raises it up, redeems it – and also completes it, finishes it off, closing it down in the finality of the figural circuit” (27). But how does Last Day Every Day realise this labour of criticism and interpretation? While Martin nimbly jumps from some writings to others, and the narration moves forward, catapulted on tiny springs (whether an image, a shared concern, or a reference common to two of the thinkers), his text dives down, takes root, picks up a denser deposit: this double movement gives the book its particular energy. The author constantly returns to a specific series of concepts related to the Last Day or Judgement Day – this is the figure that is scrutinised and obsessively pursued throughout the entire book and, each time it is revisited, we discover in it some detail or new aspect that modifies it. In this sense, the ideal movie to accompany a reading of Last Day Every Day (and I can guarantee the truth of this, since – casually or presciently – I saw it for the first time on the very same night I finished the book) is Abel Ferrara’s 4:44 Last Day on Earth (2011), a film fervently preoccupied with the implications and representation of this figure, constructed on the very same paradox that gives the book its title. In Last Day Every Day, it is not only certain concepts, images and ideas that are handled as figures; the quoted fragments, likewise, receive figural treatment. The quotations are not mere supports, nor simple tools used to authorise or confirm a hypothesis – rather, they are material that is worked and moulded, shaken and flipped, laid out in a series. Martin takes heed of the energy and rhythm of each oration and then, with his redoubtable acuity and passion – attributes that lead him to refer to one of Brenez’s definitions as a “Proustian whopper of a sentence” (8), or to arrest one of Kracauer’s maxims in order to exclaim “what a phrase, what an image, what an idea!” (19) – he rewrites every fragment and gives it back to us, illuminated from within. Therefore, one of the best things to be said about Last Day Every Day is that it inspires in the reader a genuine desire to immerse oneself in the work of those authors that mark its itinerary. When, months ago, I had the good fortune to read Last Day Every Day, I was not yet able to fully grasp, in a single pass, the intense figural work achieved by Martin; but I persevered because – as Leonard Cohen sings – “love calls you by your name”, and there are some calls that just cannot be ignored. Later, I convinced myself that I needed to translate it into Spanish (to which the author kindly agreed), and it was then that this short book began to reveal to me the many secrets that are concentrated in its pages. It did not happen immediately, but now I can clearly discern the figure created in and by this book. It is a figure formed by all the others, and evoked in the infinity of variations on the theme of seriality – variations ranging from the general (the Ricoeur quotation that we find at the beginning) to the concrete (the Agamben phrase borrowed for the title). A figure already announced in the opening paragraph – when Martin makes reference to a conference where Gayatri Spivak proceeded to open a series on books laid out on a table, utilising passages from them that she would read aloud and comment on – but that we only see in its totality once it has been completed by the author, and when the reader has taken part in it (and here is the demonstration, yet again, of how central Auerbach’s idea of figuration as a “system of prophecy”  – where a first process announces the second, and the second fulfils the first – is to Last Day Every Day). The ultimate gesture of Last Day Every Day consists of going one step further, and converting this figure into a dispositif: something like the literary equivalent of what we call the Domino Effect. The book substitutes quotations for tiles, each one standing for a distinct figure (almost always related to the central idea of the Last Day). The quotations are arranged in a series, forming a line; just a small shove is enough to cause all of them, as they make contact with the one in front, to fall down (i.e., to open up and reveal themselves). In the process, the figures in this garden will show us new perspectives and, once they have all dropped, we shall see a completely novel, global picture. The Domino Effect triggers a large-scale movement with the tiniest of gestures; but, underneath the seeming simplicity of this mechanism, there lies an arduous, minute labour of preparation, where every piece must be carefully constructed and placed, taking in charge an infinity of parameters. In Last Day Every Day, each fragment is treated as if it were the last – yet it reverberates with the effect from what has preceded it, and proceeds to wield an impact upon what follows it. In the email that concludes the book, Nicole Brenez writes that “the more [that films] are singular and unique, the more they will offer to the knowledge of figurality”, because “in their singularity, [they] are enriching the method” (32). Last Day Every Day, this modest little book “written in a few minutes after several years” (31), lays claim to this affirmation, and transforms it into a shining, exacting mission. Translated from the Spanish by Hugo Flüge, Goethe-Universität. Nicole Brenez, “To Nuance Renoir”, Transit, 19 July 2012, http://cinentransit.com/sombre-partie-de-campagne/. The Spanish-language edition, Último dia cada dia y otro escrito sobre cine y filosofía, was published by punctum books in conjunction with FICUNAM (Mexico City) in February 2013; it includes an extra essay, “Avatars of the Encounter”, which appears in English in Transit, 8 March 2012, http://cinentransit.com/rendez-vous-el-cine-encuentra-a-la-filosofia/. Martin discusses both versions of the book in his video interview for Screening the Past: http://www.screeningthepast.com/webteque/.